Handy, Handy, and Pukui (1972) described the Kāne‘ohe area thusly: The watershed of Kāne‘ohe on windward O‘ahu—an area of approximately 11,500 acres (46.6 km2)—is a wet area with lush vegetation drained by a number of, mostly perennial, streams. Average rainfall in this watershed is 40 to 60 inches (100 to 150 cm) annually, with most of the rain falling in wet season months (November through April). Torrential rains are common. 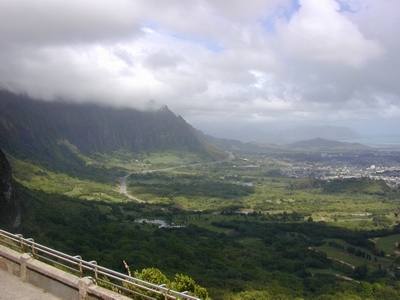 Because the watershed boundary (the Pali or "cliff") is a long, steep face of the Ko‘olau oriented into the Northeast Tradewinds, drainage after heavy rainfall is rapid. The Kāne‘ohe region was once the center for a large population of Hawaiians. The area has a rich mythology and many places along the shoreline of Kāne‘ohe Bay were considered sacred. Prehistoric ceremonial temples (heiau), several large villages, fishing shrines, and a complex of diked irrigation systems once adorned the coast. Population size varied around 5,000 souls from 1830 to 1940, although the percentage of Native Hawaiians decreased as missionaries, sailors, Asian laborers, and other immigrants settled in the region. This ahupua`a was described [two centuries] .... ago by Portlock (1789, p. 74) in glowing terms: "The bay all around has a very beautiful appearance, the low land and valleys being in high state of cultivation, and crowded with plantations of taro, sweet potatoes, sugarcane, etc., interspersed with a great number of coconut trees, which renders the prospect truely delightful". The broken topography of Kāne‘ohe arranges the areas of flatland like chains of pockets connecting along its stream channels between hills. On the north side of the ahupua‘a near the boundary of He`eia, Kea‘ahala Stream flows into Kalimukele, coming out of He`eia. Some of the best lo`i still in use in 1953, mauka of the highway, were irrigated by Kea`ahala, and a large old lo`i system once extended downstream below the highway. An elaborate system of water rights prevailed in ancient times throughout these sections irrigated from Kea`ahala. The other streams—Wailele (formerly Pani‘ohelele), Hi‘ilaniwai, Kahuaiki, Mamalahoa -- likewise watered many taro lo`i. Hi‘ilaniwai [now Kāne‘ohe] is a very long stream, with its origin in the slopes that drain Pu‘u Lanihuli, the peak that flanks the northern side of the Nu‘uanu Pali road and the southern boundary of Kāne‘ohe. In fact all of the ahupua‘ is like a vast green amphitheater below the serrated sheer cliffs that extend from Pu‘u Lanihuli northward to Ha`iku Valley and known as the Ke-ahi-a-Kahoe (Fires-of-Kahoe) Cliffs. As the ground rises steeply from the stream beds along their upper courses, there is little evidence of systematic terracing observable in these areas, as might have been expected. The lowland lo‘i areas were so extensive that evidently the more laborious terracing of the interior slopes was not regarded by the early Hawaiians as necessary. The kula lands between the streams were planted in pandanus, wauke, bananas, and sweet potatoes. Kalo malo`o (dry-taro) was not planted here. The number of names of ‘ili and kuleana on kula lands along the Hi`ilaniwai and its tributaries, however, indicates extensive cultivation of products other than taro, and the abundant rains sweeping down from the cliffs made such cultivation profitable. Below the majestic cliffs of the Ko‘olau range was Kekele, the famous grove of pandanus trees, precious because of their fruit clusters whose orange-yellow "keys" or separate seed were in old times much used for making lei. Many pandanus trees may still be seen on the hillside below the cliffs. The town of Kāne‘ohe, near the southeast end of Kāne‘ohe Bay, is the principal community in this watershed. It has undergone extensive urbanization within the past 50 to 60 years. After World War II, Kāne‘ohe experienced a "boom" as urban development increased throughout O‘ahu. The town's population rose 450% between 1940 and 1960, from approximately 5,400 to 30,000. Two major highways, the Pali Highway and the Likelike Highway, constructed in the 1960s, link Kāne‘ohe to Honolulu, bringing increased urban sprawl to Windward O‘ahu and rendering Kāne‘ohe a "bedroom" community of the city of Honolulu. By 1990, Kāne‘ohe's population had more than doubled to an estimated 67,000. With recent completion of the H-3 Highway connecting Pearl City with Kāne‘ohe, the town's population may well increase further, although constraints on land availability are forcing growth towards communities further north along Kāne‘ohe Bay. 1951 and 1977, ruining large stretches of coral reef "gardens" and in turn causing the decline of reef fish populations. The sewage was diverted to a deep ocean outfall off Mōkapu in 1977. The bay has since shown strong signs of recovery, indicating reef resiliency to environmental stress. Nevertheless, negative impacts can multiply substantially when environmental modifications affecting water resource integrity, accumulate over time. Such impacts have affected the watershed health and water quality throughout Kāne‘ohe ahupua‘a. Citizen groups led the initiatives that have reversed a substantial amount of the environmental degradation that had historically occurred in the Kāne‘ohe watershed. The most prominent have been Kāne‘ohe Bay in Crisis and the Kāne‘ohe Bay Task Force of 1971, established in the 1970's. The accomplishments of these groups led to the establishment by legislation passed in 1990 of the Kāne‘ohe Bay Master Plan Task Force. This task force was charged with developing a comprehensive master plan to guide resource use and development in and around Kāne‘ohe Bay. According to the Task Force: "The Kāne‘ohe Bay Master Plan continues to represent a new and promising, community-based approach to sustainable coastal management and development in Hawai‘i."